The Fish Stalker is a 31′ Tiara with a 12′ beam and twin V8 454 engines providing 700 horsepower. 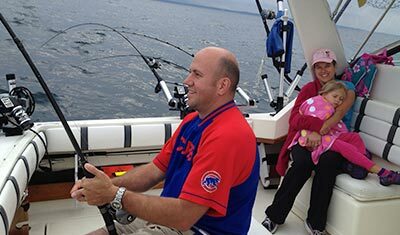 In short, she’s a prey-seeking, fish-finding machine, and she’s ready to provide you with the Lake Michigan fishing charter experience you’ve been waiting for. With an enclosed cabin and walk-in bathroom, the Fish Stalker is outfitted for your comfort. 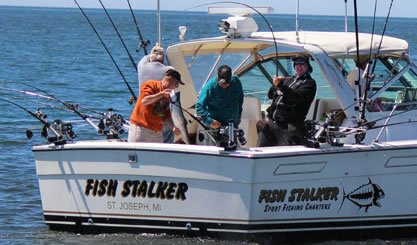 State-of-the-art equipment like GPS, autopilot, radar, marine radio, and top-of-the-line Fish Hawk speed and temperature sensors help locate the hottest spots to make your Lake Michigan fishing charter trip as productive and exciting as it can be. 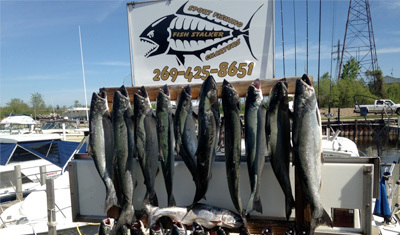 Fish Stalker Charters is inspected by the state Department of Natural Resources (DNR), licensed by the U.S. Coast Guard and fully insured for your peace of mind. Ready to board? 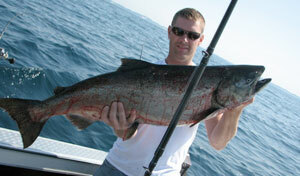 All tackle is included – all you need to bring is your license. © 2019 Fish Stalker Charters.